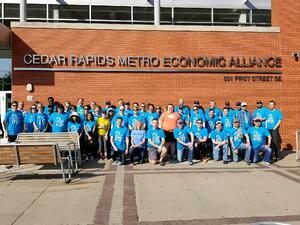 Every May, UWECI hosts Day of Caring, one of the largest organized volunteer events in Cedar Rapids. This year marked our 25th Day of Caring. On Thursday, May 10, local businesses encouraged their employees to volunteer at nonprofit agencies and schools to address community and agency needs. Participating in Day of Caring is a great way for companies to engage employees in volunteerism and for nonprofits to tackle their long list of projects. This year, employee volunteers spent their workday giving back across our community through projects such as gardening and yardwork, building wheelchair ramps, beautifying parks and playgrounds, painting and cleaning spaces for clients, performing skits for elementary school students, and many more. In addition to connecting businesses and nonprofits through volunteer projects on Day of Caring, this year we also hosted a community food drive the same day at NewBo City Market. Thank you to everyone who donated food to fill HACAP's truck. 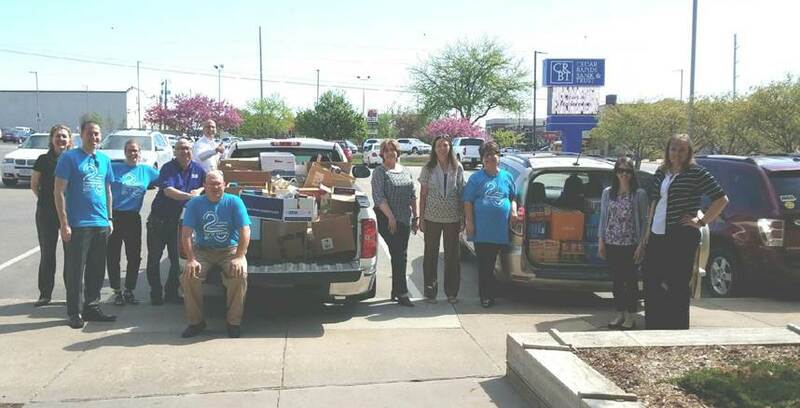 With your help, we collected 2,121 lbs of food in just one day! You can drop off additional nonperishable food donations on Food Truck Wednesdays at NewBo City Market through June 13. Learn more about how you can help us stop the growl at uweci.org/fooddrive. Although volunteers already completed this year's volunteer projects, we're not done with Day of Caring just yet! Continue to help us celebrate Day of Caring’s 25th anniversary and commemorate the 2008 flood’s 10th anniversary with the City of Cedar Rapids by following us on Facebook and Instagram for our 25 Days of Caring. See before and after photos of the flood, learn how volunteers make a difference in East Central Iowa, and answer trivia questions each week for your chance to win prizes. Thanks again to everyone who volunteered or donated food for Day of Caring! Be sure to check out our highlight video below.